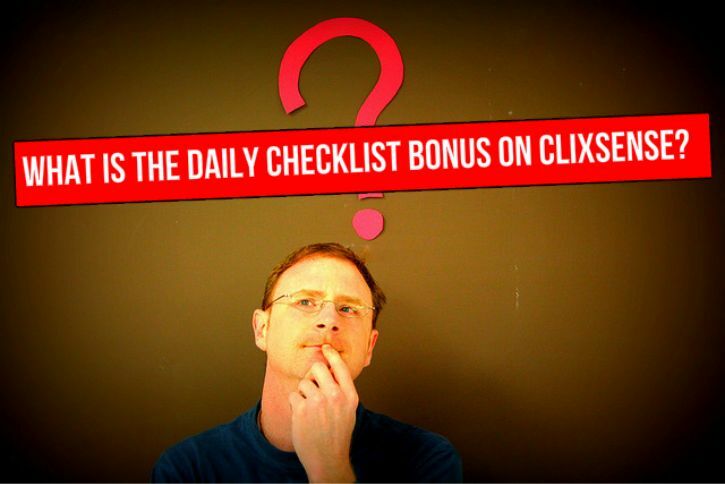 You are here: Home » PTC » Clixsense: What is the Daily Checklist Bonus? 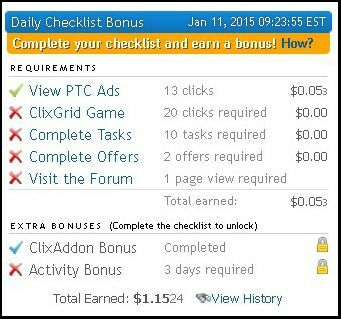 Clixsense – one of the best paid to click websites in the world – has recently (about a year ago) introduced to its members the daily checklist bonus. The Daily Checklist Bonus is a reward plan for active members that helps them to earn even more money from Clixsense. 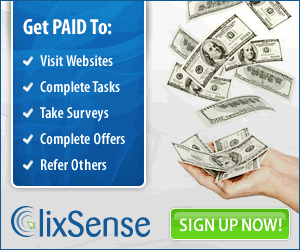 Clixsense, gives you a number of things you must do every day, to earn your Daily Bonus. For each day that you complete your Daily Checklist, a bonus is added to your account balance at the end of that day. Premium members will earn a bonus of up to 16.0% of their personal daily earnings, while Standard members will earn a bonus of up to 7.0%. The bonus amount you can earn is unlimited; it only depends on your activity. Click at least 20 ClixGrid squares. NOTE: If you win – for example – $5 on the Clixgrid, this will be counted towards your daily bonus as well. For example, if you are a Premium member and you earned $5 on the Clixgrid, you could earn an extra of up to $0.80 with the Daily Checklist bonus at the end of the day. If you are a Standard Member you will earn an extra of $0.35. Visit at least one page of our forum. (Posting is not required). After you Complete your Daily Checklist Bonus, extra bonuses will unlock. ClixAddon Bonus: Complete the checklist and run the ClixAddon for at least one hour in a given day to earn this extra bonus. Important: Survey notifications must be enabled under options. Example: You completed the checklist on Monday, Tuesday and Wednesday. On Wednesday you will get your Activity Extra Bonus. If you complete the daily checklist on Thursday you will get your Activity Extra Bonus as well. If you continue to complete your daily checklist on Friday and Saturday and so on, you will continue to earn your Activity Bonus. If for you don’t complete the daily checklist for one day, the Activity Extra Bonus will be reset and you will have to complete your daily bonus for 3 consecutive days in order to become active again. I hope you enjoyed the article and helped you understand about this unique feature Clixsense has. Clixsense has done more to help it’s loyal and active members to earn more, than any other paid to click website in the industry. If you are a member, then you are blessed, if you are not, then you should become one. There are many ptc websites out there that seem legit, but they eventually turn to scams. Clixsense is the most secure and trusted ptc website in the world and whoever decides to join ptc websites must join and FOCUS on it.